I was very impressed with this lecture series. This is the first lecture series I’ve listened to by ‘The Modern Scholar’ company, and I liked very much their audio quality in addition to the speaker’s knowledge and skill at speaking. 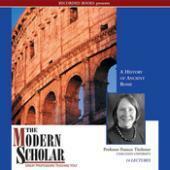 The author focused mainly on history and not on the culture of ancient Rome. This is very fair (the title is ‘a History of Ancient Rome’ after all). However I wanted to know more about the culture and politics of Rome which have such a huge impact on events. The author frequently alludes to the vast importance of the priesthood in Roman society, but I wanted to know details which we were never given. I want to know about Roman art and architecture, Roman gods and Roman mercantilism. These little details are fascinating, but this bird’s eye view of Roman history neglected all but very few of them.